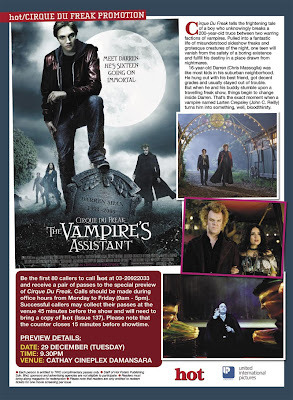 First 80 callers to call 03-2092 2033, win a pair of tickets to The Vampire's Assistant Movie from Hot Magazines! Tickets to be redeemable at the cinema 45 mins before the movie starts, with a copy of the magazine coupun's together. Call now and try your luck !! !